Track your equipment with our new SITrack Device Management System! Register for one of our training classes now! Seats are limited! Trimble Stratus software helps civil contractors use drones to map, measure and share accurate information about their worksites and assets. See what Stratus can do for you! Big screen. Giant potential. A bigger screen, powerful processing power and Windows 10 means you’re carrying all the potential of a laptop – right in the palm of your hand. 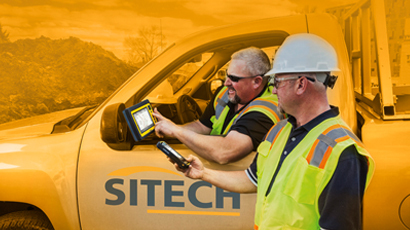 At SITECH® South, our team of experienced construction professionals offer the end-to-end integrated solutions and best-in-class support you’ve come to expect and rely on from your Trimble dealer. As the sole Trimble Construction Technologies dealer operating within Alabama, Georgia, South Florida, and Northwest Florida, SITECH South offers a centralized, one-stop location for all of your advanced construction technology needs. From heavy and highway construction, to job site positioning technology and asset tracking, SITECH has the experience, and the knowledge to ensure that you have the tools, training and support you need to succeed. You can easily reach our sales, support, and service teams by calling 404-505-8181. We appreciate the opportunity to serve you and look forward to earning your business.